Top of the Line Printing and Graphics Service in San Diego, CA is your one-stop answer for all your state-of-the-art Graphics and Printing needs. No job is too large or too small for us to handle! Call on us when you want the very best. 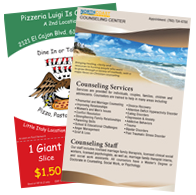 We offer many other types of printing ad well as design, if you do not see what you need here please give us a call at 858-467-9138. Here are some of Top of the Line's Top Specials! Print Ready Artwork Or We Can Set It Up For You - Price does not include shipping or sales tax.